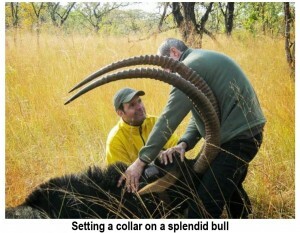 Duarte to confirm (or not) his death, to place a few new collars on pure sable including at least on the young bull Mercury, and if possible to dart some of the old 4 to 5 non-breeding cows, check their condition and maybe give them an hormonal boost to see if we could induce a late estrus. For Luando, our main objectives were to place as many new tracking collars as possible; track down known herds and animals collared in previous years while trying to find new groups, and very importantly, to get fresh information on the population trends, poaching activities and other threats. 2011, the veterinary Pete Morkel and pilot Barney O‘Hara and his Hughes 500 chopper. It is a privilege to work with them, and as in previous exercises, the procedure was a complete success! A lot of logistics had to be put in place weeks in advance. 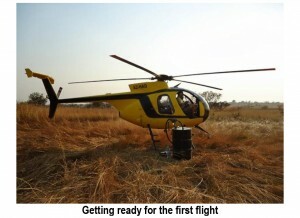 Fuel was deployed to Cangandala NP and to Luando by military truck and by an Air Force Allouette respectively. The collaboration with Administration of Cangandala Municipality and Provincial Government of Malanje was very relevant, and as always the support from Angolan Military Forces proved to be helpful. We started in Cangandala by tracking the animals on the ground and checking the trap camera records, however without encouraging results because of very atypical veld conditions. The unusually moist and prolonged wet season had delayed the grass decay and seasonal burnings. This was probably good for the animals, providing more cover, graze and water availability well into the dry season, but made our job at finding and observing sable much harder. In addition few sable used the salt licks in June, with the exception of some young females which brought from Luando in 2011. They were photographed very heavy in their second pregnancy. Ivan did not show up on any salt lick and simply vanished like a ghost for the two-week period that the operation lasted. His collar wasn‘t active anymore, and several hours spent flying over his territory produced no results. Similarly Duarte wasn‘t to be found anywhere, as his collar also wasn‘t active, probably result of the serious fight with Ivan that may have taken his life. 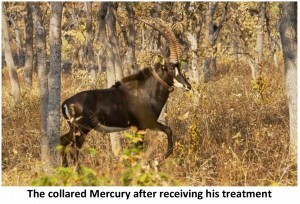 The collared Mercury after receiving his treatment Everything else was very successful in Cangandala. We managed to dart and collar Mercury. 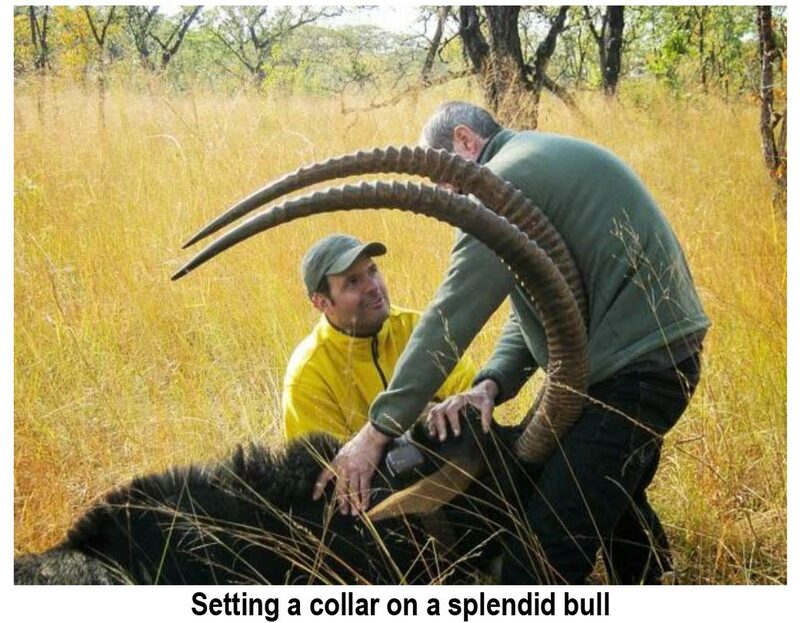 This bull has just turned three, and while his horns still haven‘t curved much they are over 40 inches long. The three young females that had been photographed very pregnant a month earlier, now all had three calves, and we didn‘t disturb them any further. On the other group we found the two old breeding cows pregnant, and managed to dart and collar the four remaining cows (the fifth one hadn‘t been seen for almost one year and must have died). The non-breeding condition of the four old cows was confirmed by Dr. Morkel and a hormonal injection was administered. Finally and on the last day of flying, we were able to dart a young cow, the second sable born in the sanctuary in 2010, which is now in her first pregnancy! same spot! In subsequent days we located the second known herd, and eventually found a new herd. However, we couldn‘t find two of ―old‖ groups; one is suspected to have been poached out. Various females were darted and collared in each herd, and several territorial bulls were also found, darted and collared. In total, ten females and ten males were darted in Luando, from different groups and different age classes. Several sable bulls were very impressive. The seven adult bulls darted measured between 52 and 58 inches. On the second day of flying in Luando, we observed one of the most extraordinary scenes I will ever witness. We had found the main herd on a large ―anhara‖, and after a very short chase, Pete placed a dart in a young female. As she was part of a large group about to enter the woodlands, we decided to give chase from close distance. As Barney maneuvered the chopper over the tail of the herd, and as the darted female started to slow down slightly … a huge black-mane lion came out of nowhere, jumping to the back of the female and quickly knocking her to the ground! We could not believe our eyes! 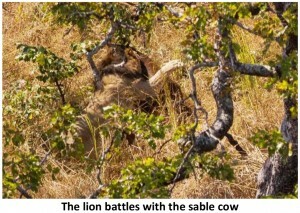 There was a lion in Luando, and it had attacked a sable cow right underneath the chopper! Everyone was screaming inside the chopper; I was in overdrive taking as many photos as I could, while trying to get rid of the seat belts to find a better observation angle. Barney lowered the chopper close over the battle scene while blowing the chopper siren continuously, and eventually the lion decided to move away. The whole event didn‘t take longer than a few seconds. Under the effect of M99 drug and being knocked down by a monster cat, the female wasn‘t going anywhere. 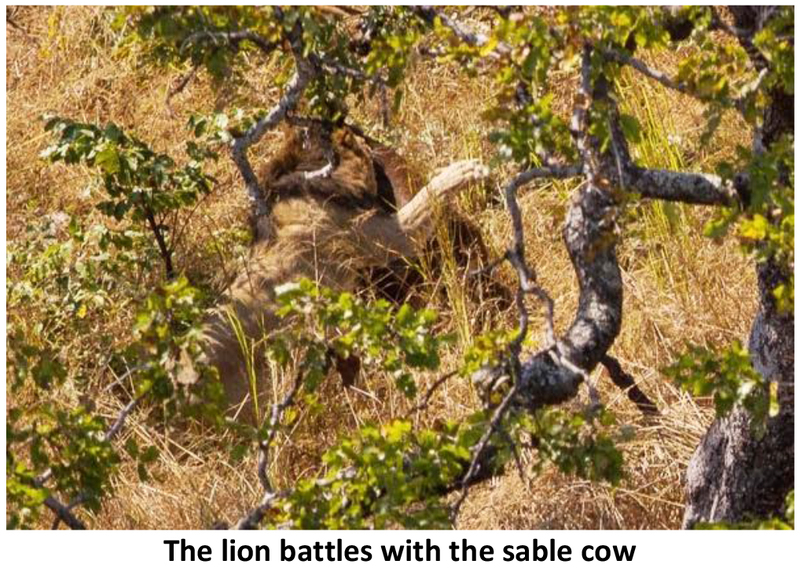 As soon as the lion fled the scene we landed the chopper next to the sable cow and assisted her on the ground. We inspected the three years old female which was well advanced on her first pregnancy! Surprisingly she had suffered only minor injuries, only scratches on the back and neck, and a superficial wound on the belly. There were no bite wounds, and the sable skin had proved to be quite resistant to the lion claws on his first wave of the assault. The belly wound was bleeding slightly and Pete, concerned that infection could set in cleaned the wound abundantly with water, disinfected it and treated the female with antibiotics. The female was then marked, collared and released. To improve her survival chances, we chased her a couple kilometers from the scene. In subsequent days we confirmed that the female had recovered completely and had rejoined the herd. Then we returned and looked for the lion but we could never find him again. That‘s when we started to realize the gravity of the situation, We had an active sable predator on the loose around our most important herd! There is little doubt that the lion must have been there tracking down the sable for a meal. And chances are he‘s done it before and will do it again. This can be a real problem. The sable numbers are so desperately low, that all it takes is one lion killing one sable every few weeks, to compromise the population‘s recovery. However, the lion is not our biggest concern. The main predator in Luando walks on two legs, and during the operation we were confronted with new evidence on a daily basis. Some of the poaching examples we witnessed are quite shocking. 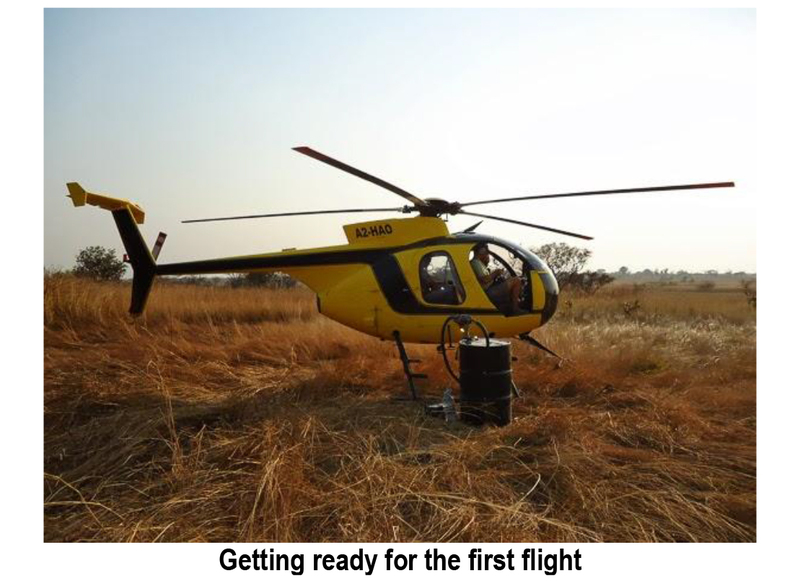 The fact that the previous season was very wet meant that the poachers had to delay somewhat their dry season snaring activities, as they usually place the traps around strategically burnt grass patches, and water holes. In spite of this, we found plenty of areas trapped, including one given water hole, located deep inside a herd‘s territory, and with huge snare traps clearly targeting sable. In Cangandala, south of the sanctuary, we found a live duiker caught in a snare, which we were able to release, while in Luando we found two dead duikers that had died snared and left to the vultures. In comparison to 2011 we found less traps and poaching camps, but this may well have been because this operation was done earlier and the dry season was delayed this year. More worrying is the fact that in previous occasions we found most of the snares to be made of nylon and the minority made of cable, but this time the vast majority of 60 snares collected were made of steel cable, therefore much more lethal. We also came face to face with several vivid examples of the effects of cable snares on sable. Two darted females had amputated legs. One was a four year old female with the right front leg amputated below the knee. 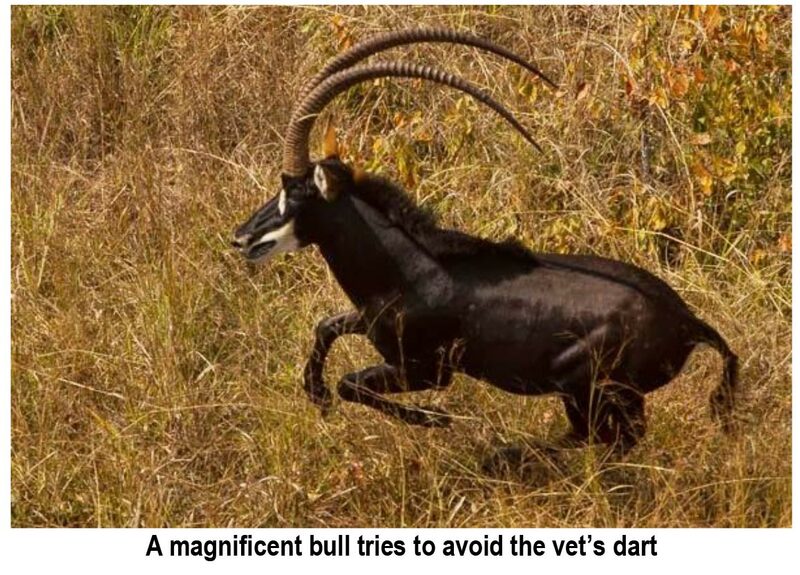 The incident had probably happened 1 to 2 years ago and the injury had healed remarkably, but she has a serious limp, and has never produced a calf. The other was an older female which had the left hind leg amputated. 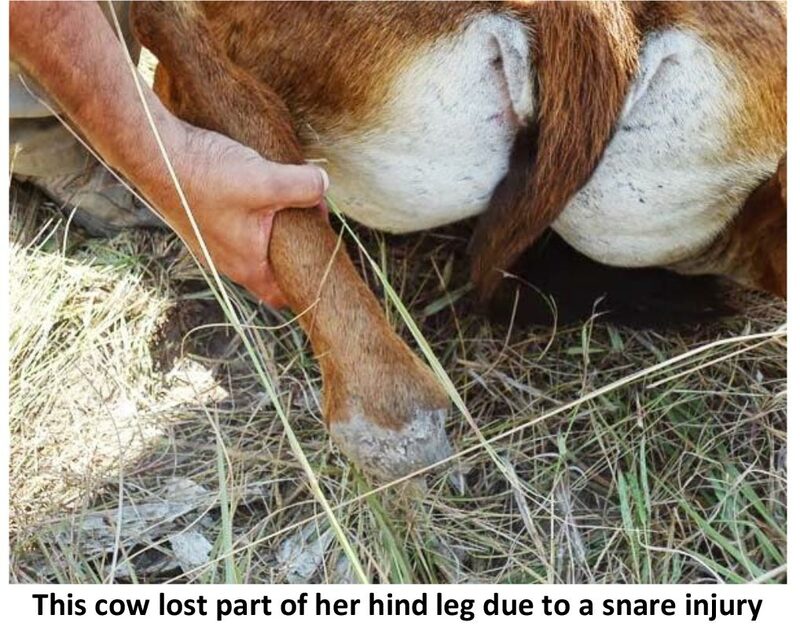 In addition two of the bulls found were limping, and after being darted and inspected, they revealed serious injuries on their right hind legs, also clearly caused by snare traps. Maybe because of their stronger built, or simply because they were luckier, they managed to recover without leg amputations, but they still carry nasty scars resulting in deformed and less functioning legs. It is unclear just how much they are affected but their breeding abilities might well be compromised. In total, a staggering rate of 20% of all darted animals (males and females) had serious snare injuries. Considering that this might be the tip of the iceberg, representing just the ones that survived, we can have a good idea on the magnitude of this problem. Surely this level of poaching pressure translates into a completely unsustainable takeoff. As far as we could tell, some poaching originated in the local villages. 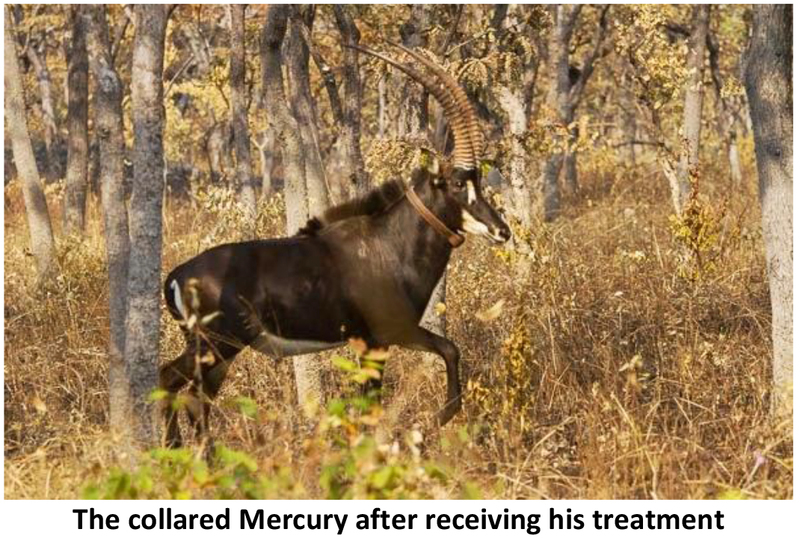 But the more organized and most worrying type of poaching, targeting the larger antelopes such as sable, seems to be fueled by a constant demand for meat to supply the diamond outfits established along the Kwanza River. We now have a very good picture on the real situation on the ground, numbers and location of herds, and the level of threats. Compared to 2011, the sable population doesn‘t seem to have decreased further, but it hasn‘t increased either. Rather, it seems to have stabilized around dangerously low figures: there aren‘t more than a hundred giant sables left! Over the next few months we expect to implement a series of anti-poaching activities in collaboration with the military. You can see more of Pedro vaz Pinto‘s photos here.